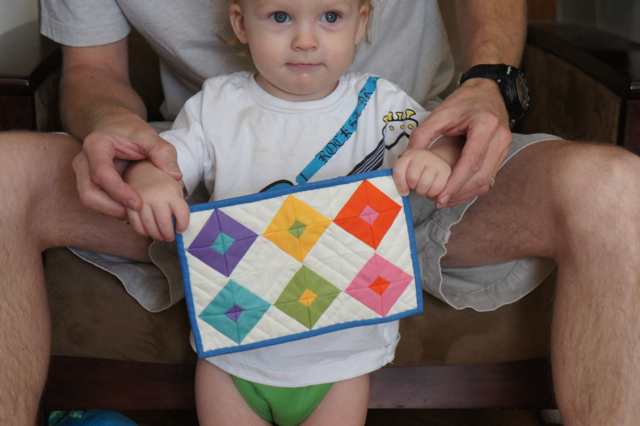 A mini-quilt and a mini-quilt-model. The boy was dying to get his hands on this one, so I put him to good work. 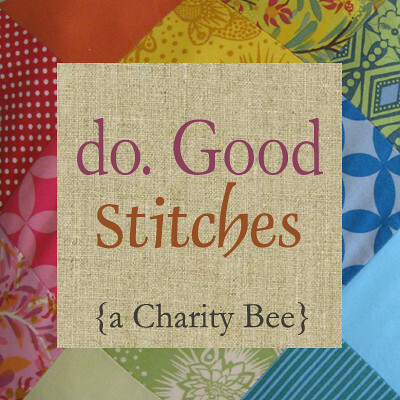 Faith over at Fresh Lemons is leading a challenge to get us to expand our comfort zones and try some new techniques by making and posting about a mini-quilt each Monday in September. This little mug rug (which is probably smaller than the intended mini-quilt, but oh well) was made using the HST from a tube technique. Only this time, one side of each tube was made from two strips of color, while the other was a solid white. I had thought about doing this previously when I was writing the HST tutorial, but finally decided to give it a go. I also machine quilted it. Machine quilting is still new to me, and I’m not crazy about my results so far, but perhaps with practice they’ll be more acceptable. You can’t see it here, but on the back the starts and stops are just so visible as big blobs of thread. I’m not sure why that happened. The backing is something Faith will recognize as I got it from a recent de-stashing of hers. 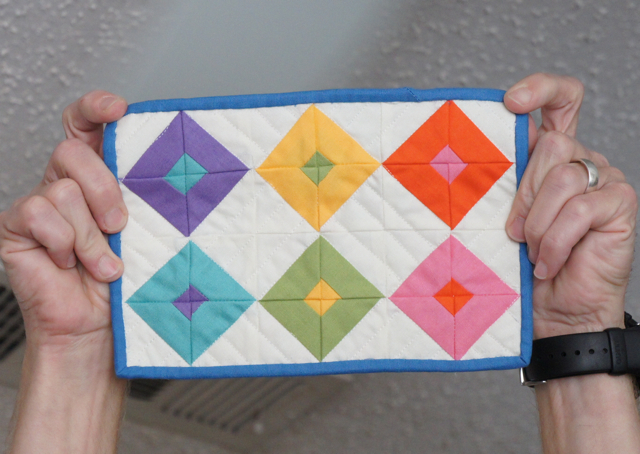 Another new thing for this quilt (it’s jam packed with new experiences for such a tiny quilt). I tried — desperately — to machine bind it. Four times I started, and four times I ripped it out. That’s a lot of teensy tiny blue and white threads all over my red tee-shirt! Finally I gave in and did the binding by hand like I always do. I don’t know. I guess I enjoy the process of binding by hand, so I really don’t have a whole lot of motivation — or patience — to learn to do it on the machine. 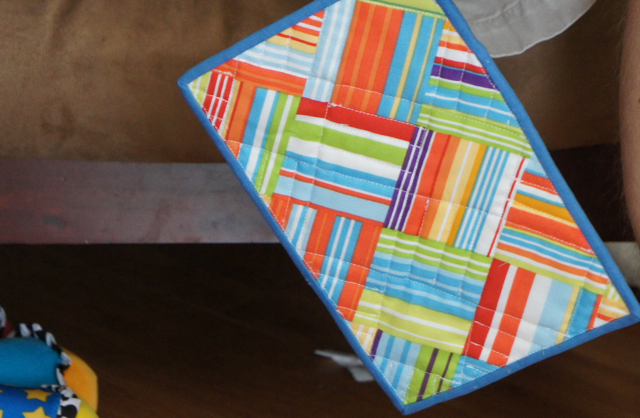 Anyway, this little quilt is bound (ha-ha) for Alexis’ desk. I think the boy-child will be most upset that it is not for him. Well maybe he can have the next one, are you going to do one every week? great colors! and i love your tube technique, i will have to try that! I love it! 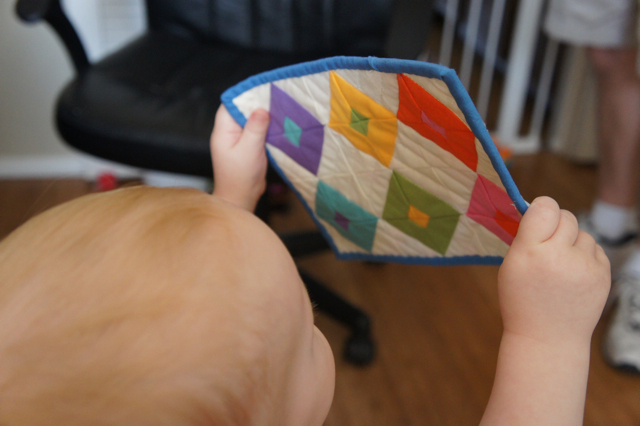 That is just the sweetest little mini quilt (and model). 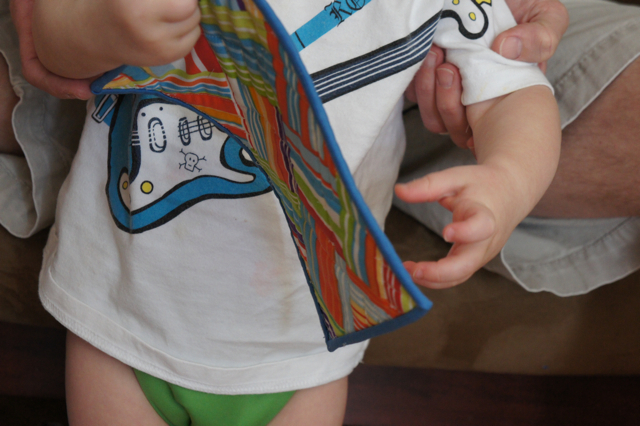 I love how you turned the back print at a diagonal – genius! 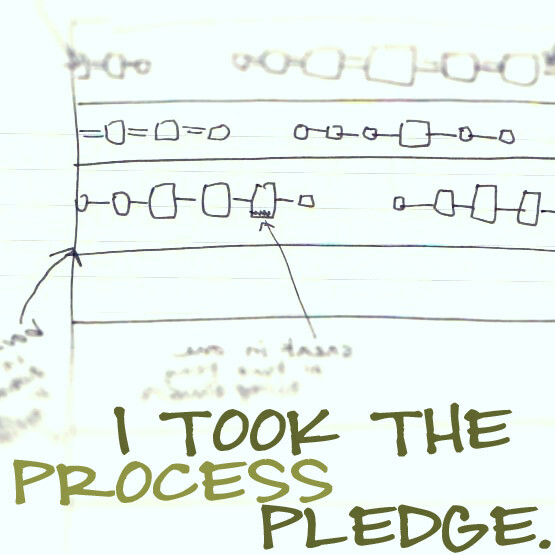 wow – that IS alot of learning in one little project – but that’s great! It’s darling. I need a mug rug! So cute! Not sure what the tube technique is, but the result is darling!